By Wojciech Sas - PhD candidate. Our complex number calculator (also known as an imaginary number calculator) is an excellent tool for solving basic operations with complex numbers. Read on to find the answer to the question: "what is a complex number? ", learn about the algebraic and polar form of complex numbers, and master the skills of multiplying and dividing complex numbers. At the end of this text, you can also find information about the properties of complex numbers (most of which are based on the conjugate or the absolute value of complex numbers), and even some practical applications of them. z = a + bi. Here, both a and b are classically understood real numbers. When b = 0 the number is purely real, and if a = 0 we have a purely imaginary number. 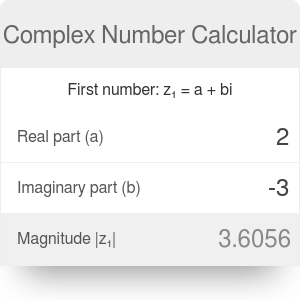 You can use this complex number calculator as an imaginary number calculator - just input the real component equal to 0. Another way to write two parts of a complex number is Re and Im, so that Re(z) = a, and Im(z) = b. As we can see, the conjugate of a complex number doesn't affect the real part, while the imaginary part has the opposite sign as the original. where |z| is the modulus/absolute value of the complex number, φ is known as an argument or phase (sometimes we use notation arg(z) = φ), and tan is the tangent of the given argument. Similarly, the length of a vector in the two-dimensional Euclidean plane is the distance between its end and the origin of the coordinate system. 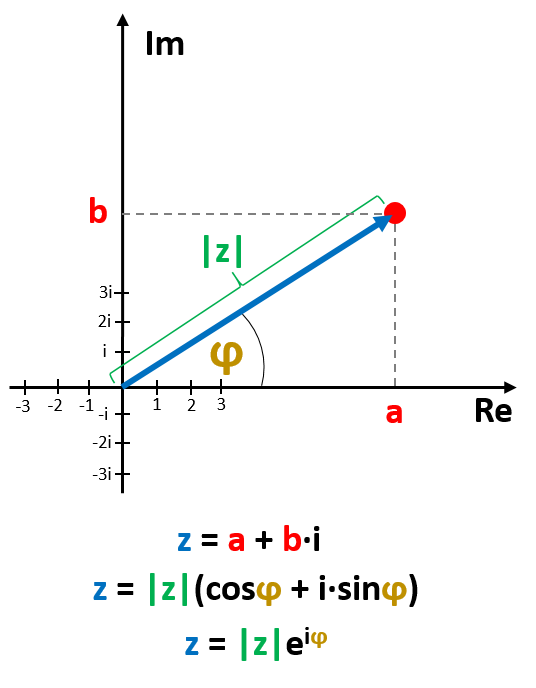 The angle φ is measured from the X-axis counterclockwise, and it can vary from 0 to 2π, or from -π to π (depending on convention since both are equivalent). b = |z| * sinφ. Here sin and cos are basic trigonometric functions. These formulas are derived from the relations in the right triangle on the complex plane. In other words, the complex number can written as: z = |z| * (cosφ + i*sinφ). where k is any integer number. The polar form of complex numbers is very useful in various calculations, including multiplication, division, or even some more sophisticated ones. The exponential form is especially handy if you are not proficient enough in trigonometric laws, or you just prefer to work with powers. When performing simple operations with complex numbers, it's helpful to think about them as vectors. Then, it's pretty straightforward how to achieve both addition and subtraction of complex numbers. where Re(F + G) = a + c is the real part of the sum, and Im(F + G) = b + d is imaginary one. and now Re(F - G) = a - c, and Im(F - G) = b - d.
Do you remember how to add or subtract two 2D vectors? It's precisely the same as we do it in this complex number calculator - you just need to add (or subtract) each pair of components separately, and that's it! F * G = (a + bi) * (c + di) = a*c + a*d*i + b*c*i + b*d*i*i = (a*c - b*d) + (a*d + b*c)*i. This time the real part can be written as Re(F * G) = a*c - b*d, and imaginary part as Im(F * G) = a*d + b*c. Note that there is a minus sign in the real part, since, at some point, we faced a multiplication of two imaginary numbers i*i, which equals -1 by definition. F / G = (a + bi) / (c + di) =, extend both numerator and denominator by conjugate of a complex number of the latter. = (a + bi) * (c - di) / ((c + di) * (c - di)) =, perform standard multiplications. = (a*c - a*d*i + b*c*i - b*d*i*i) / (c² - (di)²) =, once again, use the fact that i*i = -1. = (a*c + b*d + (b*c - a*d)*i) / (c² + d²). We obtain the following results: Re(F / G) = (a*c + b*d) / (c² + d²), Im(F * G) = (b*c - a*d) / (c² + d²). Of course, the division is possible only if G ≠ 0.
and we can see that: |F * G| = |z₁*z₂|, and arg(F * G) = φ₁+φ₂. rewriting the result as: |F / G| = |z₁/z₂|, and arg(F / G) = φ₁-φ₂. Using this form, it's clearly visible that the resulting module is just the ratio of both numbers absolute values. It looks like the second attempt is much simpler, thus sometimes it's worth considering changing the form of our expressions before starting a calculation. We can always come back from polar to algebraic notation. If you don't feel comfortable with it, just use our complex number calculator to make sure the outcome is correct. We can make a brief overview of how to calculate some more complicated operations with complex numbers. Firstly, let's find the general formula for the complex power of two numbers, given as F^G. F^G = (a + bi)^(c + di) =, since it isn't obvious how to extend that expression we can write F in the polar form of complex numbers. = (|z₁|*exp(iφ₁))^(c + di) =, now the product to any power of a sum is the product of each element to every component separately. = |z₁|ᶜ * exp(iφ₁*c) * |z₁|ᵈⁱ * exp(-φ₁*d) =, we can use the known property of exponent that is: x^n = exp(n * ln(x)), where ln is the natural logarithm. = |z₁|ᶜ * exp(-φ₁*d) * exp(i(φ₁*c + d*ln|z₁|)). Then, the absolute value is: |F^G| = |z₁|ᶜ * exp(-φ₁*d), while the argument is: arg(F^G) = φ₁c + d*ln|z₁|. Although we are mixing two different notations, it's fine. We can also change them any way you like - that's all your choice. ln(F) = ln(|z₁|*exp(iφ₁)) = ln(|z₁|) + iφ₁. One critical remark: since the phases φ₁ and φ₁+2kπ are equivalent, the complex logarithm has an infinite number of solutions, and the general result is given as: ln(|z₁|) + i(φ₁+2kπ). The tool is really simple to use. All you have to do is write both the real and imaginary part of two numbers. If a number is purely real or purely imaginary, set the other component equal to 0. And that's it. As a result, you will obtain the polar form of complex numbers, the sum, the difference, the product, the quotient, as well as the first number to the power of the second one, and the logarithm of the first number. There are several properties of complex numbers, including conjugate or the absolute value of complex numbers, which can be handy while calculating some exercises. if z = 0, then both a = 0, and b = 0. Complex numbers are sometimes really helpful with algebraic expressions, especially if they are related to trigonometric functions. Many physics problems benefit from the power of complex numbers. One of the main fields of complex number usage is the world of wave functions and harmonic motion. Multiple problems from electronics can be significantly simplified with complex numbers. You can check how it is done in practice with the voltage divider calculator. Wojciech Sas - PhD candidate. Complex Number Calculator can be embedded on your website to enrich the content you wrote and make it easier for your visitors to understand your message.